The Immigration Reform and Control Act of 1986 (IRCA) required employers to verify that all newly hired employees presented facially valid documentation verifying the employee's identity and legal authorization to accept employment in the United States. The I-9 form, or more properly the Employment Eligibility Verification Form, is provided by the federal government for that purpose. Every employee hired after November 6, 1986 must complete an I-9 form at the time of hire. Employees must complete Section 1 of the form upon commencing employment. The employer must complete Section 2 within three days of the employee's starting date at work. The employer is responsible for ensuring that the forms are completed properly and in a timely manner. The I-9 is not required for unpaid volunteers or for contractors. However, a company could still find itself liable if it contracts work to a contractor it knows either is or employs unauthorized workers. Several versions of Form I-9, Employment Eligibility Verification, have been issued since the form was first introduced in 1987. Not all versions are valid for use. 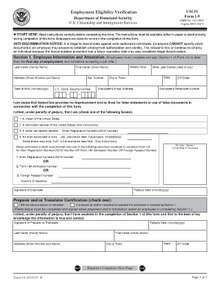 To determine whether you are using the correct version of Form I-9, look at the revision date printed on the bottom left corner of the form, and not the expiration date printed at the top of the form. If an employee cannot read or cannot write in English, a translator or preparer may complete the form and sign it on behalf of the employee. The form also requires the employee's own signature. In October 2004, new legislation made it possible to complete the I-9 electronically. An alien authorized to work. One document that establishes identity (on List B) together with another document that establishes employment eligibility (on List C). Trusted traveler documentation (Global Entry, NEXUS, SENTRI). Employees who supply an item from List B (to establish identity) must also supply an item from List C (to establish employment eligibility). Consular Report of Birth Abroad (Form FS-240). Employees who supply an item from List C (to establish employment eligibility) must also supply an item from List B (to establish identity). Employers must update or reverify certain ID documents at or prior to their expiration date. This does not apply to already presented and accepted non-expired U.S. Passports or Permanent Resident Cards when they reach their expiration date, nor to any List B documents (e.g., state driver's licenses and state IDs). The USCIS website, in the Employer section, Employer Bulletins, lists the limited requirements and allowed instances for reverification. For U.S. citizens, I-9s are valid continuously unless a break of more than a year of employment occurs. International employees on F-1 (student), H-1B (specialty occupation), or J-1 (exchange visitor) visas must have their I-9 reverified each time their visa has expired with a new work authorization permit (renewed visa with work authorization, EAD, Permanent Residence Card, etc.). Employers must retain a Form I-9 for all current employees. Employers must also retain a Form I-9 for three years after the date of hire, or one year after the date employment ends, whichever is later. Employers must show their employees' I-9 form any time the immigration or labor authority requests it. The Immigration Reform and Control Act which introduced the requirement leading to the promulgation of the I-9 form also included anti-discrimination provisions. Under the Act, most U.S. citizens, permanent residents, temporary residents, asylees or refugees who are legally allowed to work in the United States cannot be discriminated against on the basis of national origin or citizenship status. This provision applies to employers of three or more workers and covers both hiring and termination decisions. In addition, an employer must accept any valid document or combination of documents specified in the I-9 form as long as the documents appear genuine. For example, an employer could not refuse to hire a candidate because his I-9 revealed that he was a non-citizen (such as a permanent resident or a refugee) rather than a U.S. citizen. For this reason some immigration lawyers advise companies to avoid requiring an I-9 until a candidate is hired rather than risk a lawsuit. As another example, a company could not insist that an employee provide a passport rather than, say, a driver's license and social security card. Another anti-discrimination provision requires that employers must enforce I-9 compliance in a uniform manner. For example, an employer must not require some employees to complete an I-9 before being hired, but allow others to complete the form after starting employment. Employers must not assume that the employee is unauthorized to work just because the individual either could not bring the proof of employment authorization or has brought the unaccepted documents until the start date of the employment. Instead, employers should encourage that employee to bring the acceptable documents which are under the List A, B and C. Employers may terminate the employment only if the employee cannot attest the person's work authorization by bringing the proof after the start date. The Office of Special Counsel for Immigration-Related Unfair Employment Practices ("OSC") is a section within the Department of Justice's Civil Rights Division that enforces the anti-discrimination provision of the Immigration and Nationality Act ("INA"). The OSC can help workers by calling employers and explaining proper verification practices and, when necessary, by providing victims of discrimination with charge forms. Upon receipt of a charge of discrimination, OSC investigations typically take no longer than seven months. Victims may obtain various types of relief including job relief and back pay. OSC also has an extensive outreach program. It provides staff to speak at outreach events throughout the country, and has free informational brochures, posters and tapes for distribution. With respect to hiring, firing, recruitment or referral for a fee by employers with four or more employees, employers may not treat individuals differently because they are or are not U.S. citizens or work-authorized individuals. U.S. citizens, recent permanent residents, temporary residents, asylees and refugees are protected from citizenship status discrimination. However, permanent residents who do not apply for naturalization within six months of eligibility are not protected from citizenship status discrimination. Citizenship status discrimination which is otherwise required to comply with law, regulation, executive order or government contract is permissible by law. With respect to hiring, firing, recruitment or referral for a fee by employers with more than three and fewer than fifteen employees, employers may not treat individuals differently because of their place of birth, country of origin, ancestry, native language, accent or because they are perceived as looking or sounding foreign. All U.S. citizens, lawful permanent residents and work authorized individuals are protected from national origin discrimination. The Equal Employment Opportunity Commission has jurisdiction over employers with fifteen or more employees. Relating to verifying the employment eligibility of employees, employers may not request more or different documents than are required to verify employment eligibility, reject reasonably genuine-looking documents or specify certain documents over others with the purpose or intent of discriminating on the basis of citizenship status or national origin. U.S. citizens and all work authorized individuals are protected from document abuse. Individuals who file charges with OSC; who cooperate with an OSC investigation; who contest action that may constitute unfair documentary practices or discrimination based upon citizenship, immigration status, or national origin; or who assert their rights under the INA's anti-discrimination provision are protected from retaliation. The IRCA includes penalties for I-9 noncompliance. Federal law provides for imprisonment or fines for making false statements or using false documents in connection with the completion of the I-9. An employer who hires an unauthorized worker can be fined between $250 and $5,500 per worker. In addition, such an employer can be barred from federal government contracts for a year. An employee who knowingly accepts fraudulent documentation can also be criminally prosecuted under other immigration laws. An employer who fails to keep proper records that I-9s are properly filed can be fined $110 per missing item for each form, up to $1100 per form, even if the employee is legally authorized to work in the United States. Since 2009, Immigration & Customs Enforcement (ICE) has conducted over 7,500 audits and imposed over $80 million in fines. In 2011 alone, ICE conducted 2,740 audits and assessed over $7 million in fines. An individual who knowingly commits or participates in document fraud may be fined between $375 and $3,200 per document for the first offense and between $3,200 and $6,500 per document for subsequent offenses. ^ a b c d e f g h i j k l m n o p "ABCs of Immigration: I-9 Compliance - Avoiding Immigration Bombshells". Siskind Susser Bland. Retrieved 2007-06-03. ^ "Questions and Answers Revised Form I-9, Employment Eligibility Verification Effective". ^ "May I accept expired document form i9". United States Citizenship and Immigration Services. United States Government. Retrieved 3 August 2018. ^ "The HR Professionals Guide to Form I-9 by EBI: I-9 Acceptable Documents for Proof of Identiy". www.ebiinc.com. Retrieved 2018-12-20. ^ a b "USCIS - List C Documents". ^ Parser, Jennifer G.; David L. Woodard; Poyner Spruill LLP (August 28, 2012). "The Importance of an I-9 Form". The National Law Review. ^ "Form M-274: Handbook for Employers: Instructions for Completing Form I-9 (Employment Eligibility Form)" (PDF). United States Citizenship and Immigration Services. April 3, 2009. "About Form I-9, Employment Eligibility Verification"
"Revised Form I-9, as of April 3, 2009"